Our canadian speed skaters represented us well both on senior and junior levels in the past two weeks at the World Single Distance Championships in South Korea and the World Junior Championships in Finland. De Haître and Blondin performed well in Gangneung. Our athletes obtained good results at the 2018 Olympics test event in Gangneung. Vincent De Haître from Ontario, was one of the best skaters for Canada at the World Championships with a silver medal in the 1000m and a fourth place in the 1500m. Ivanie Blondin performed well on the longer distances with the bronze in the 5000m and a fourth place in the 3000m. Don't forget the amazing performance from Quebec’s own Olivier Jean in the mass start event that gave him his first long track World Championships medal. Tyson Langelaar competing with the best juniors in the world. The ISU Junior Speed Skating World Championships ended with a great total of 8 medals from our young canadian skaters. Tyson Langelaar from Manitoba got two individual bronze medals (1000m and 1500m), allround third place and won the silver medal in the team sprint with his teammates Connor Howe and David La Rue. Langelaar’s last lap was amazing. Béatrice Lamarche was the best woman in this competition for Canada with a bronze medal in the 1000m and in the mass start. David La Rue, who just started long track, got an impressive fourth place in the 1000m and participated in the team sprint silver medal. The inexhaustible Graeme Fish won bronze in the 5000m and in the mass start. Long track future is in good hands. Canadian performances at the Single Distances World Championships are a good sign for the Pyeongchang olympics and the future of speed skating in Canada is in good hands with some promising young skaters like Béatric Lamarche, Tyson Langelaar and David La Rue. 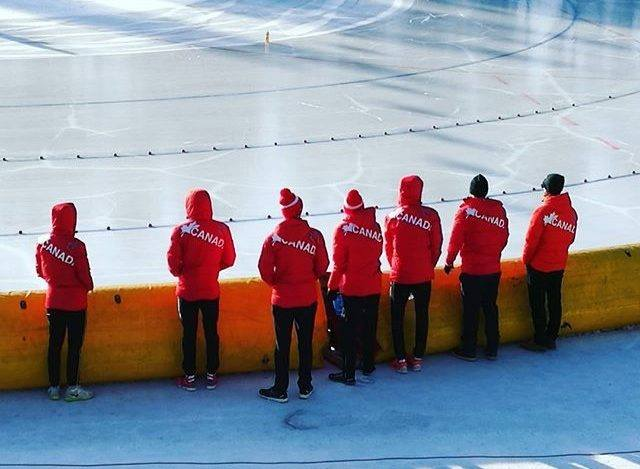 Nos patineurs canadiens nous ont bien représenté sur la scène internationale durant les deux dernières semaines, notamment aux Championnat du Monde par distances individuelles en Corée du sud et aux Championnats du Monde Junior en Finlande. De Haître et Blondin obtiennent de bonnes performances à Gangneung. Les patineurs canadiens ont offert de bonnes performances à l'événement test pour les Jeux Olympiques de Pyeongchang. L'ontarien Vincent de Haître a été un des meilleurs canadiens en obtenant une médaille d'argent sur 1000m et une 4e position sur 1500m. Ivanie Blondin a quant à elle bien performé sur les longues distances avec une 3e position sur 5000m et une 4e position sur 3000m. Notons également l'incroyable performance du québécois Olivier Jean au départ en groupe avec une médaille de bronze. L’ancien patineur courte piste, en provenance de Lachenaie, semble avoir réussi son pari de se concentrer sur la longue piste avec une telle performance contre les meilleurs au monde. Tyson Langelaar parmi les meilleurs juniors au monde. Le championnat du monde junior s'est soldé avec une récolte de 8 médailles du côté de nos jeunes canadiens. Notre meilleur représentant a été le manitobain Tyson Langelaar avec ses deux médailles de bronze individuelles, sa médaille de bronze au cumulatif et son incroyable dernier tour qui a permis au Canada de se hisser sur la deuxième marche du podium au sprint par équipe derrière les puissants néerlandais. Chez les femmes, Béatrice Lamarche a récolté le bronze sur 1000m et au départ en groupe. Le québécois David La Rue, qui n'a que quelques mois d'entraînement sur la longue piste, a récolté une 4e position en plus de participer à l’obtention de la médaille d'argent du Canada au sprint par équipe. Notons aussi les médailles de bronze de l'inépuisable Graeme Fish sur 5000m et au départ en groupe. L’avenir du longue piste entre bonnes mains. Les performances de nos représentants aux Championnats du Monde sont encourageantes pour les Olympiques de 2018 et l'avenir du longue piste canadien semble assuré avec des patineurs prometteurs comme Béatrice Lamarche,Tyson Langelaar et David La Rue. Canada completed the weekend of the 5th event of the short track speed skating World Cup circuit with more than a third of all the medals being awarded in Dresden, Germany. The distances this weekend were 1000m, 500m and two 1500m plus the team relay event which, if you're new to short track speed skating, consists of 3000m on the women side and 5000m for the men. In the 1000m event, Marianne St-Gelais won gold while Valérie Maltais got the bronze medal. The two veteran skaters were joined on the podium by the young sensation from the Netherlands, Suzanne Schulting. Jamie Macdonald, also from Canada, finished in ninth place. No podium for the canadian men on this distance as Charle Cournoyer finished in fifth place by winning the B final. François Hamelin finished ninth while Guillaume Bastille concluded this distance in fourteenth position. The big final was won by frenchman Thibaut Fauconnet who, after a year off, is having a pretty strong season so far. Hwang Dae Heon of Korea, won the silver medal followed by J.R. Celski (U.S.A) with the bronze. In the first 1500m of the weekend, Kim Boutin from Sherbrooke, won the gold medal. She was followed by Rianne de Vries of the Netherlands and Charlotte Gilmartin of Great-Britain. The two other canadian women racing this first 1500m, Kasandra Bradette and Marie-Eve Drolet, finished in thirteenth and twentieth position. On the men's side, Charles Hamelin, won the distance by beating Hong Kyun Hwan from Korea and russian skater Alexander Shulginov. Samuel Girard finished in fifth position while Pascal Dion finished tenth on the distance. On the sprint event of the weekend, three canadian women battled their way up to the A final. At the finish line, Marianne St-Gelais finished first winning her second gold medal of the weekend. Jamie Macdonald from Canada won the bronze , while corean skater Kim Ye Jin finished second. Kasandra Bradette came in fourth place. Charles Hamelin of the canadian male team finished also fourth. The podium was occupied by the Liu brothers from Hungary (Shaolin Sandor with the gold and Shaohang with bronze) while Hwang Dae Heon of Korea won the silver medal. Canadian skater Pascal Dion concluded the distance in sixth position while Samuel Girard saw his rise being stopped in quarter-final, after breaking one of his blades at the start, because of a contact with Hwang Dae Heon. On the second 1500m race of the weekend, Valérie Maltais won the bronze medal behind Suzanne Schulting (Netherlands) and Noh Ah Rum (Korea). Other canadian women, Kim Boutin and Marie-Eve Drolet, finished fifth and twenty-first. No canadian skater in the big final of the men's portion of the event as Netherlands' star Sjinkie Knegt climbed on the highest step of the podium winning gold. Hungarian skater Csaba Burjan won silver, while Vladislav Bykanov from Israël got the bronze. The three canadian men taking part in this second 1500m of the competition, Charle Cournoyer, François Hamelin and Guillaume Bastille, finished eight, ninth and eighteenth. On the team relay competition, canadian women won the bronze medal finishing third behind the Netherlands (gold) and Italy (silver) while the men's team finished fifth winning the B final. Russia, Netherlands and Korea finished in first, second and third place. In the end, Canada finishes the event with more World Cup points than any other countries competing in Dresden. The athletes were fighting for ten podiums, Canada ends the weekend with nine medals out of twenty-six available. Next meeting will take place in Minsk, Belarus. Canadian athletes can thank the Quebec Speed Skating Federation, British-Columbia Speed Skating Association and the short track speed skating fans all accross Canada (See the Change of scenery at speed Skating Canada article) for getting the opportunity to compete next weekend in the last World Cup event before the World Championships in March. C'est avec plus du tiers des médailles disponibles ce weekend que le Canada a complété la cinquième manche de la Coupe du Monde qui avait lieu en Allemagne ce weekend. La compétition comprenait un 1000m, un 500m et deux 1500m en plus du relais par équipe 3000m chez les femmes et 5000m chez les hommes. Sur 1000m, Marianne St-Gelais remporte l'or et Valérie Maltais le bronze. Les deux vétérantes canadiennes sont accompagnées sur le podium par la jeune sensation néerlandaise Suzanne Schulting. Jamie Macdonald, également du Canada, termine cette distance en 9e position. Pas de podium canadien chez les hommes sur 1000m alors que Charle Counoyer termine cinquième en remportant la finale B. François Hamelin, quant à lui, termine neuvième alors que Guillaume Bastille se contente de la quatorzième position. Le français Thibaut Fauconnet, qui connait une excellente saison 2016-17 après une pause l'an dernier, remporte l'or devant le coréen Hwang Dae Heon et l'américain J.R. Celski. Sur le premier 1500m du weekend, Kim Boutin, originaire de Sherbrooke, remporte l'or devant la néerlandaise, Rianne de Vries et la britannique Charlotte Gilmartin. Les autres canadiennes, Kasandra Bradette et Marie-Eve Drolet, terminent respectivement treizième et vingtième. Chez les hommes, la locomotive de Ste-Julie, Charles Hamelin, remporte la distance devant le coréen Hong Kyun Hwan et le russe Alexander Shulginov. Samuel Girard termine cinquième alors que Pascal Dion se classe en dixième position sur la distance. Chez les femmes sur 500m, trois canadiennes se retrouvaient en grande finale sur cinq patineuses. Marianne St-Gelais remporte sa deuxième médaille d'or de la fin de semaine. La coréenne Kim Ye Jin remporte l'argent devant Jamie Macdonald du Canada. Kasandra Bradette termine en quatrième position. Chez les hommes, Charles Hamelin termine en quatrième position alors que le podium est constitué des deux frère Liu de la Hongrie (Shaolin Sandor remporte l'or et Shaohang le bronze) alors que Hwang Dae Heon de la Corée remporte l'argent. Pascal Dion termine sixième, alors que Samuel Girard doit se contenter de la vingt-troisième position après avoir vu un bris de lame l'empêcher de prendre part à sa course en quart de finale après un accrochage au départ avec Hwang Dae Heon. Sur le deuxième 1500m du weekend, Valérie Maltais remporte le bronze derrière Suzanne Shulting (Pays-Bas) et Noh Ah Rum (Corée). Les autres canadiennes Kim Boutin et Marie-Eve Drolet terminent cinquième et vingt-et-unième. Pas de canadien en grande finale chez les hommes alors que celle-ci est remportée par le Néerlandais Sjinkie Knegt. Le hongrois Csaba Burjan remporte l'argent alors que l'israélien Vladislav Bykanov s'approprie le bronze. Les trois canadiens en lice dans cette épreuve, Charle Cournoyer, François Hamelin et Guillaume Bastille termine huitième, neuvième et dix-huitième. Au niveau de l'épreuve des relais par équipe, les canadiennes remportent le bronze derrière les Pays-Bas et l'Italie alors que l'équipe masculine termine en cinquième position, remportant la finale B. La Russie, les Pays-Bas et la Corée termine un, deux et trois. Au final, le Canada termine le weekend avec le plus grand nombre de points de Coupe du Monde parmi tous les pays présents. Les athlètes se battaient pour dix podiums, le Canada termine avec neuf médailles sur vingt-six disponibles. Prochain rendez-vous, la semaine prochaine à Minsk alors que les athlètes canadiens profiteront de la générosité de la Fédération de Patinage de Vitesse du Québec, de l'Association de Patinage de Vitesse de la Colombie-Britannique et des adeptes de courte piste (voir le texte: Du mouvement chez Patinage de Vitesse Canada ) pour participer à la dernière manche de la Coupe du Monde avant le Championnat du Monde qui aura lieu en mars. It is now official : Canada will be represented in the last events of the World Cup Circuit in both long track and short track speed skating. While we don't know yet who will take part in the long track event being held in Stavanger, Norway from March ten through twelve, the short track team for the sixth World Cup event in Minsk, Belarus is set. Guillaume Bastille, François Hamelin, Pascal Dion and Patrick Duffy will join Jamie Macdonald, Valérie Maltais, Kim Boutin, Kasandra Bradette and Marie-Eve Drolet for this trip to Europe. On the noble side of things, we have to salute the actions taken by the two provincial entities. Every speed skating fan in Canada is happy to know that we, as one of the most dominant country in speed skating, will take part in all the events included in the World Cup circuit. It would probably never come to mind, to most of the the speed skating fans, that NOT competing in an international event would be an option for Canada. We also have to be happy for our athletes. They will be able to complete a regular season the same way they normally do and prepare for next year's Olympic Games that will take place in South Korea. Fighting against their toughest opponents in every occasion they have until the games is important. But it's quite evident that from now on, everyone in the country who's linked to speed skating will keep Speed Skating Canada on their radar. Some changes have already took place. Peter Metuzals who was Senior Advisor, Marketing, Sponsorship and Business Development at Speed Skating Canada since July of 2013 as been fired. Patrick Godbout who's already working for the organisation as Communications and Media Relations Manager will do the follow up with the partners and sponsors. This decision has been shared with the partners, sponsors, athletes and different federations earlier this week. Yesterday, Speed Skating Canada also announced in a press release that Susan Auch, who was until now president of the board of directors, would assume the interim as Chief Executive Officer since Ian Moss and Speed Skating Canada are parting ways. Finaly, the season will end up being pretty much a regular one and we can already assume, since 2018 is an Olympic year, that next season will take place without a hick-up. Like I said earlier, Speed Skating Canada now has a new task : convincing us that this situation was just a stumble. It is imperative that the option of having well managed provincial federations paying the bills for our national athletes doesn't become a norm. In fact, he shouldn't even become an option. The door that was open this year, needs to be closed, locked and the key should be thrown away. Outside of public and private partners or sponsors already linked to Speed Skating Canada, we need to take a look at how the sport is promoted. At the moment, we seem to rely on the strong base and rise of interest that comes every four years because of the Olympic Games. We need to build an interest that goes beyond that. I can't speak too much about long track events cause I'm not active on that part of our sport right now, but I sure have ideas about how short track speed skating could be promoted differently and I'll be more than happy to share it with you soon. La nouvelle a finalement été annoncée cette semaine. Le Canada sera bel et bien présent aux sixièmes manches de Coupe du Monde longue piste qui aura lieu du dix au douze mars à Stavanger, en Norvège et courte piste qui aura lieu à Minsk en Biélorussie du dix au douze février prochain. Si l'équipe de longue piste n'a pas encore été annoncée, on sait déjà qu'en courte piste, le pays sera représenté par une solide équipe composée de Kim Boutin, Kasandra Bradette, Marie-Eve Drolet, Valérie Maltais et Jamie Macdonald chez les femmes et Guillaume Bastille, Pasal Dion, Patrick Duffy et François Hamelin chez les hommes. Le geste des deux entités provinciales est noble et bien sûr, tout le monde se réjouit de savoir que le Canada, l'un des pays les plus décorés en patinage de vitesse dans le monde, sera représenté dans tous les événements de la saison. Tout le monde est également soulagé pour nos athlètes qui auront la possibilité d'avoir une saison complète et de se préparer de façon optimale pour les Jeux Olympiques de 2018 qui auront lieu en Corée du Sud, mais il est évident qu'à partir de maintenant, les yeux de tous les gens impliqués dans le patinage de vitesse, seront rivés sur Patinage de Vitesse Canada. Des actions ont déjà été posées puisque Peter Metuzals, qui était depuis juillet 2013 responsable du marketing, des commandites et du développement des affaires pour Patinage de Vitesse Canada a été congédié durant la dernière semaine. Patrick Godbout, déjà à l'emploi de Patinage de Vitesse Canada en tant que responsable des communications et des relations avec les médias s'occupera de faire le suivi des dossiers. La décision du conseil d'administration de mettre à pied M. Metuzals a été annoncée aux athlètes, fédérations et partenaires en début de semaine. Hier, Patinage de Vitesse Canada a également émis un communiqué annonçant que l'organisme et son chef de direction Ian Moss se séparaient d'un commun accord et que Susan Auch, présidente du conseil d'administration, le remplacerait par intérim. Au final, la saison se déroulera pratiquement de façon normale et nous pouvons déjà prévoir que la saison prochaine, une année olympique, devrait également se passer sans embûche. Comme je le disais auparavant, Patinage de Vitesse Canada a maintenant la tâche de prouver à tous que ce n'était qu'un faux pas. Il est également impératif que ce geste posé par deux fédérations définitivement bien gérées ne soit plus jamais nécessaire. La porte qui a été ouverte en cette saison 2016-17 de demander aux athlètes de l'équipe nationale de payer eux-mêmes leurs déplacements, doit se refermer et non être vue par Patinage de Vitesse Canada comme un sauf-conduit offert par les fédérations provinciales. Au-delà du financement publique et privé des partenaires de Patinage de Vitesse Canada, la promotion du patinage de vitesse se doit d'être revue. On semble pour le moment se fier que la base sera toujours maintenue plutôt que de viser à créer un intérêt général pour le sport en dehors des années olympiques. Je ne peux m'avancer sur les actions à poser pour ce qui est du longue piste, étant personnellement moins impliqué dans ce volet du sport, mais j'ai définitivement des idées pour ce qui est du courte piste et je vous en ferai part dans un texte à venir.